Another first bin at the Aiguille du Midi except this time I am with Emily because last night I convinced her to come up Mont Blanc du Tacul with me. After climbing with Ally yesterday you could see the amount of people that were still going up with skis, so as I had today off work and the weather looked good until the early afternoon I though I should give it a go as I have not been up there before and I still don’t want to put my skis away! Arriving at the Midi at 7:30 there was no one there but then by 7:45 there was easily a few bins worth of climbers and skiers waiting to go up, well worth getting there 15 minutes earlier and eat breakfast at the front of the line! The Aiguille du Midi at 7:35! At the top by 8:30 and a quick ski to the start of the climb just to the right of the Triangle. 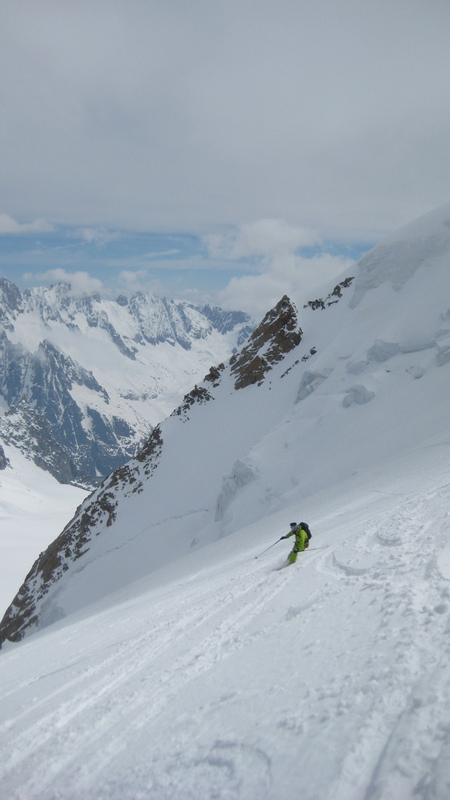 There is a over 600m of vertical from the Col to the summit, and then you have to climb back up the Midi arete when you have skied back down. 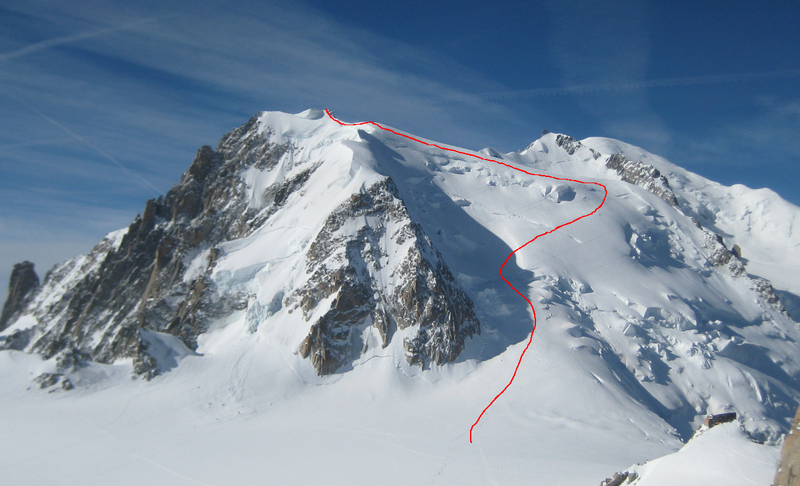 This climb has to be done early and quite quickly because the snow warms up quickly in the sun and also there is a lot of exposure above you on the first half of the climb, very big seracs looming above. Have to make it a quick drink of water! The going was quite good to start off with then Emily started to feel the altitude a little when we were over 3900m, this only slowed us down a little. Emily charging up with the Sallanches valley way in the background. 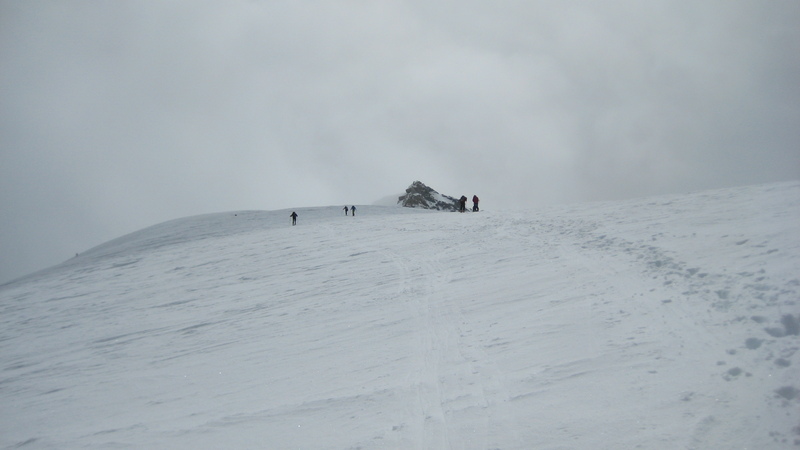 Just as we were over the 4000m mark the clouds started to move in, I could see the summit at this point and it looked very close. The wind had also picked up and it became very cold. Emily had said that if I wanted to go to bag the summit that she would have waited where we had got to which was around 4100/4150m judging by where the summit was. I didn’t fancy it, by this point you could only see it every now and then and it was not looking like it would improve. The summit just before the clouds came in, we went a little closer than this. 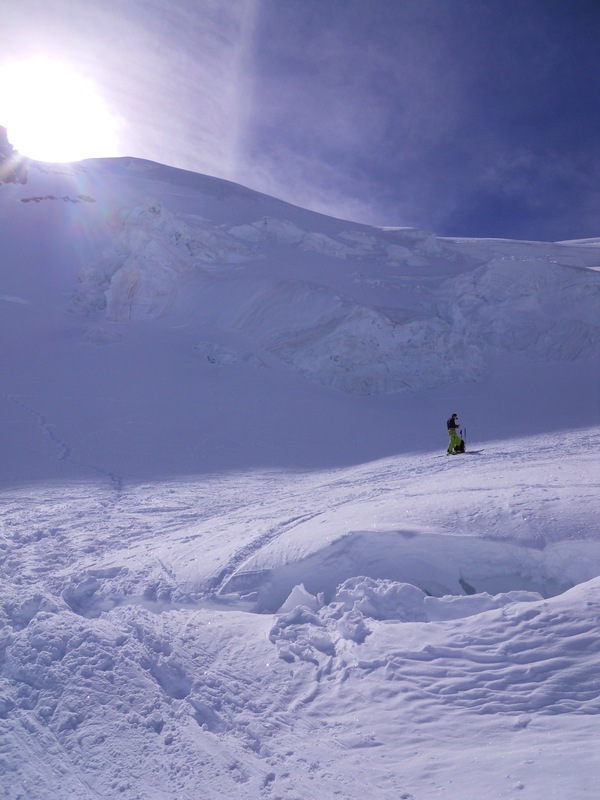 We then decided just to head back down before we couldn’t see a thing, we still had over 500m of decent with big seracs and crevasses to negotiate. The snow on the way back down was pretty good considering it hadn’t warmed much and was still quite firm. 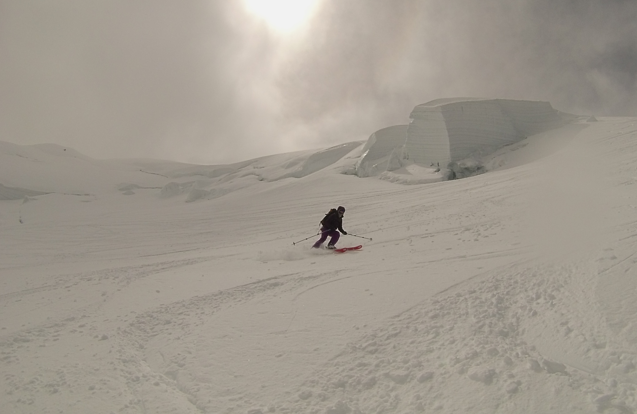 There was no crust and you could even kick up some snow with more aggressive turns. There were lots of patches of untouched snow that was much nicer than the chopped up walking and skin track parts. 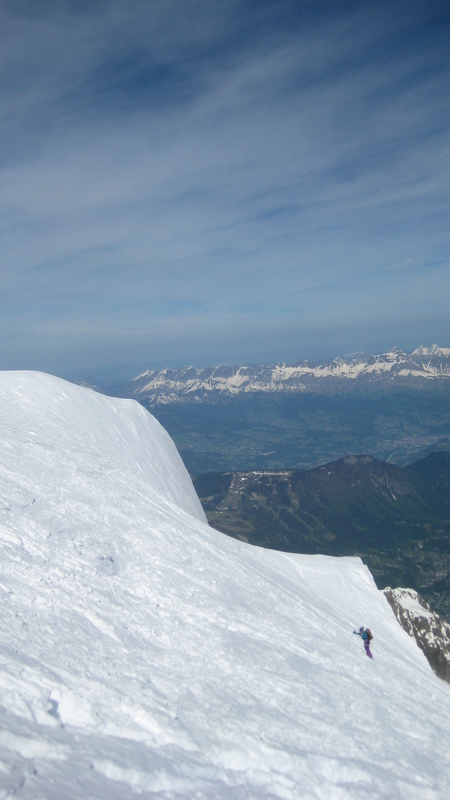 Overall the guide book says its 30/40′ slopes on the descent, it was not very steep overall but with a lots of clear danger you still had to take care where you were going! I think we made a good decision by turning around, as we noticed that many of the other skiers that had set out from the first few lifts had aso turned back just before the summit and speaking to others in the lift after, only people staying at the Cosmiques refuge and lycra clad ski-mo types made it to the top before the clouds came in. Arriving back at the Midi at 1:45 it was a white out, we just made it up the arete in the last bit of sunshine. 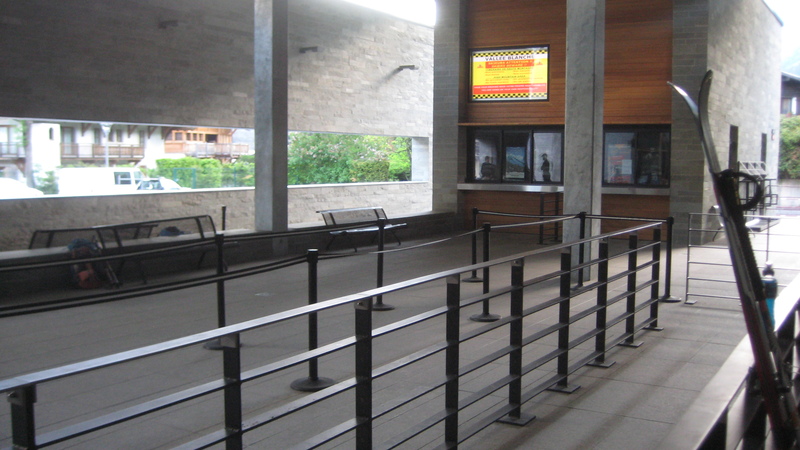 It looked a lot different at 9am! 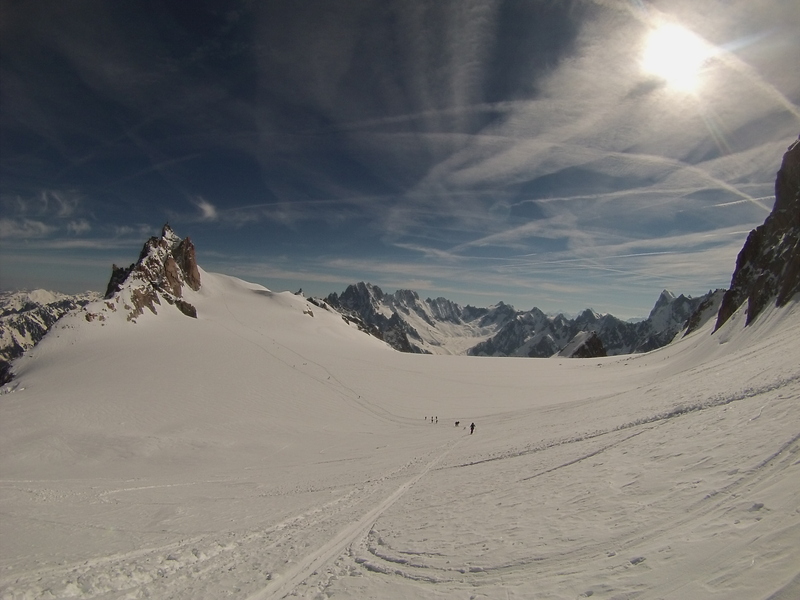 Another quality day up the Midi and its definitely something I will have to go and finish off, Maybe next week!